The system discourages scorched-earth politics and forces candidates to build a broader coalition of support, advocates say. To win a primary race in Maine next month, candidates will have to do something unusual: Aim not just to be voters' first choice, but their second, third and perhaps fourth choice, too. 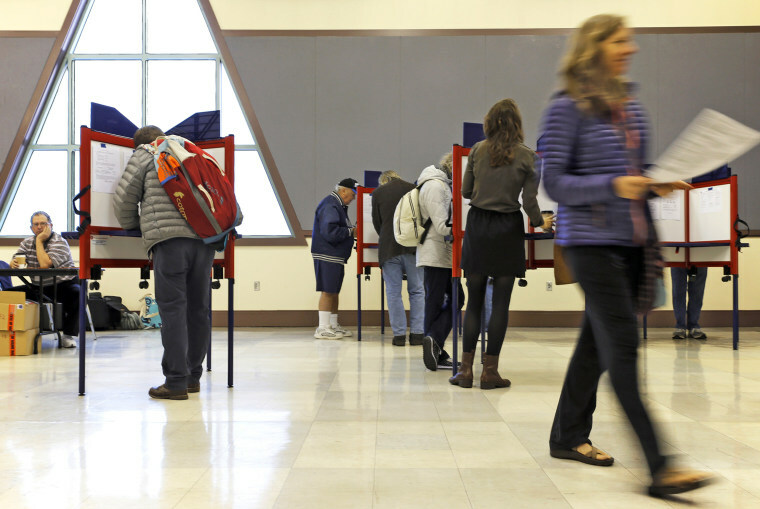 Maine is the first state to use the ranked-choice voting system for statewide and federal elections, earning plaudits from advocates who say it is a step toward making the U.S. a better, less polarized democracy. How it works: In primaries with more than two candidates, voters will rank candidates in order of preference on their ballots. If no candidate receives a majority of first-choice votes, the candidate with the fewest number of first-choice votes is eliminated. Ballots cast for the eliminated candidate are then recast for the voter's second-choice pick. The elimination and retabulation process continues until there are two candidates left in the race; the one with the most votes is declared the winner. "It gives voters more choice, more voice," said Kyle Bailey, the campaign manager for the Committee for Ranked Choice Voting, a group that has lead the three-year fight to implement the system in Maine. Bailey said the system discourages scorched-earth politics and fringe candidates who appeal exclusively to a narrow part of the electorate and forces candidates to build a coalition of support — because they may need voters to consider ranking them as their second or third choices. Critics, however, say the old system worked fine and protest spending money to put a new one in place. Maine Republicans, in particular, have chafed under the court-mandated implementation of ranked-choice voting, and argue they should have the power to decide the rules of their primaries. "We just want our people to vote for their first choice," said Jason Savage, the executive director of the Maine Republican Party. "We want ours to be a clean, less expensive and easy-to-understand process." Four June races will use ranked ballots, thanks to their candidate count: both party's primaries for governor, where there are seven Democrats and four Republicans on the ballot; the Democratic primary in Maine's 2nd Congressional District; and a Republican primary in one state legislature race, according to the Secretary of State's office. If one candidate in any of those contests receives a majority of first-choice votes on election night, June 12, the winner will be known when initial vote tallies are reported. If not, ballots are collected and transported to Augusta, Maine, for the ranked-choice tabulation. In that case, it could be a week before voters know who won. Ranked-choice voting is used internationally in countries like Australia and Ireland, as well as in some U.S. cities, but the state's transition from the most common voting system — in which voters select just one candidate — has been fraught. After organizers used a ballot referendum to get ranked-choice voting approved in 2016, state officials questioned its legality while legislators and critics filed lawsuits and proposed legislation to eliminate it. The courts ruled it could not be used in state general elections because the Maine Constitution specifically says winners will be elected by plurality, not majority, but they approved its use in state primaries and in federal elections in the state. The issue comes to a head on Election Day: The same ballot that will give Maine voters their first taste of statewide ranked-choice voting also includes a second referendum on whether to keep the system. If it fails, the ranked-choice voting system will be halted unless organizers can get the state Constitution changed, which would require far more support in the legislature than they've previously enjoyed. State of Maine sample ballot. Savage worries the system could lead to disenfranchisement. Ballots in multicandidate races that lack second choices — or fourth or fifth choices, depending on the round of ranked-choice voting — can be declared exhausted and removed from the voting pool during the calculation process, meaning that the final winner might not have a majority of all the initial ballots cast. Still, Maine isn't the only state curious about trying a new system. According to FairVote, legislation on ranked-choice voting was under consideration in 18 states and Democrats have pushed for its implementation in New York City. Proponents of ranked-choice say it provides a necessary course-correction to America's modern political system, where crowded races deprive winners of majority support. Bailey, the organizer, said in nine of the last 11 races for Maine's governor, the winner won with less than 50 percent of the vote. Rob Richie, the president of FairVote, a nonpartisan group that advocates for election reforms, including ranked-choice voting, said: "When you have elections with two choices, our election (system based on plurality) works great. When you have more than two choices, it stops working." “A lot of Republicans were interested in it in 2016,” Richie said, when 17 candidates entered the GOP race for president. "A lot of Democrats are going to get super-interested in it in 2020 when they have 15 people running." CORRECTION (May 24, 9:34 a.m.): An earlier version of this article misstated how Maine’s courts have ruled on ranked-choice voting. The courts have barred using it for statewide general elections, not federal general elections.